Jonathan FickiesEducators take part in the Program Approval: New CTE Program Applications workshop during the event. 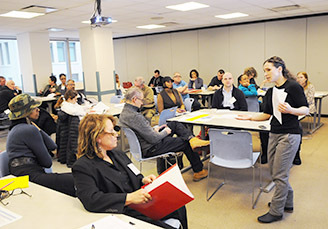 Hundreds of career and technical education professionals from New York City public schools came to UFT headquarters on Feb. 2 for the CTE at the Core Conference, a professional development session that offered an opportunity to network and launched National CTE Month. 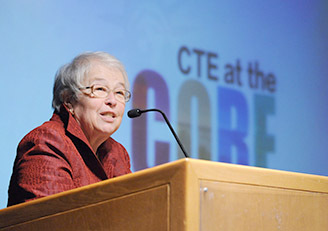 Jonathan FickiesSchools Chancellor Carmen Fariña joins in welcoming everyone to the conference. It’s been a busy month — and year — for career and technical education! Both the ceremony and the entire month are dedicated to celebrating the great work that CTE teachers and students are doing in their classrooms every day. In the rush of our daily lives, we don’t often have time to reflect on our accomplishments. Career and Technical Education Month is that time. The work done by teachers like Leo Gordon from Ralph McKee HS, Ed Hawkins from the HS for Construction Trades, Engineering and Architecture, Robert Martinez from Transit Tech Career and Technical Education HS and all the rest of our awardees is truly phenomenal. But CTE month isn’t just about celebrating our work. It is also a time to think critically about the future of CTE and the direction we want it to go. If we ever had an opportunity to shape that direction, it is now. It has been a truly great year for CTE, and there is more to come. The stars are aligned for us, with support plentiful at the city, state and federal levels. Everyone is looking to CTE. That’s why I’m so pleased to announce the progress of our National Industry Certification for Educators, or NICE, initiative. For those who are not familiar with it, NICE consists of three main components: a train-the-trainer program that teaches educators who already hold industry credentials how to best share their knowledge with students and colleagues; industry certification courses for educators who do not already hold industry credentials; and a school-based pilot program that will pair selected schools with industry partners to improve students’ access to knowledge, skills and credentials. The development of the train-the-trainer component began earlier this school year. Now we are in the process of setting up certification courses with our industry partners that will be available for educators to take starting in the 2015–16 school year. We are also on the cusp of releasing our Request for Proposals for schools to apply for the school-based pilot program, which will also begin next school year. The goal of this initiative is to expand the great work many of our schools are already doing with different industry partners and to involve those partners in a much more structured way in teacher development and school support. In some schools, our students are building computers. In others, they are filming movies or filling eyeglass prescriptions or building solar-powered vehicles. NICE will ensure that these students and their teachers have the proper support — through professional development and industry partnerships — that they need to do the best work they can. It’s because of the work we have already done that attitudes about CTE have changed. More and more people today understand that CTE gives our students 21st-century skills and teaches them values like perseverance. The success of NICE and our other CTE initiatives will create even more opportunities for CTE to expand and flourish. 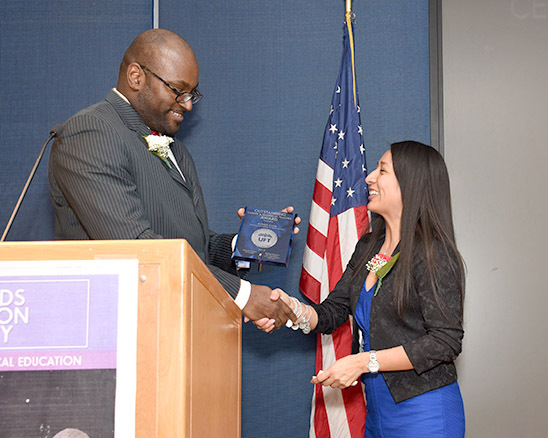 Miller PhotographyUFT Vice President for Career and Technical Education High Schools Sterling Roberson presents an Outstanding Teacher Award to Esther Cuya of Union Square Academy for Health Sciences, Manhattan, during the Celebrating Career and Technical Education Awards Recognition Ceremony on Feb. 5 at UFT headquarters. See page 12 for complete coverage of the event.